To supplement its current fleet of armoured vehicles, many of which are over 30 years old, the Turkish Land Forces Command asked 11 companies worldwide to submit detailed proposals for a new infantry fighting vehicle family. Seven companies responded. A key part of this proposal was technology transfer to Turkish industry with 50 to 70 per cent being built in Turkey. 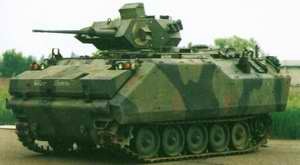 In 1986, three vehicles were shortlisted, the now BAE Systems, Ground Systems (at that time United Defense) Armored Infantry Fighting Vehicle (25 mm cannon), the GKN Defence (today BAE Systems Land Systems) Warrior (30 mm RARDEN cannon) and the Krauss-Maffei/Diehl Puma (20 mm cannon). 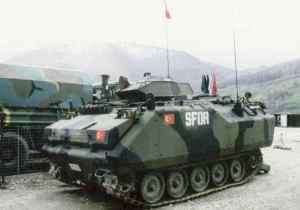 These underwent extensive mobility, high-altitude, cold weather, road, cross-country and various obstacle trials in Turkey and the now BAE Systems, Ground Systems Armored Infantry Fighting Vehicle was subsequently selected. 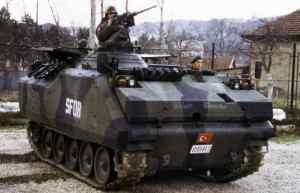 In June 1988, FMC-NUROL Savunma Sanayii AS (FNSS), a joint venture company between the now BAE Systems, Ground Systems of the US and the Turkish-based NUROL Group, signed a contract to produce the Armored Infantry Fighting Vehicle (AIFV) to meet the requirements of the Turkish Land Forces Command. However, with the purchase of United Defense LP by the Carlyle Group from the FMC Corporation, it was deemed inappropriate for FNSS to maintain the original name of FMC-Nurol. The Board of Directors issued a resolution to change the name of the company. As from 15 August 1998 the company name was changed to FNSS Savunma Sistemleri AS. The original contract called for the delivery of the vehicles over an eight-year period but, in 1995, this was extended to 10 years. The contract had a total value of USD1.076 billion to manufacture 1,698 armoured combat vehicles to meet the requirements of the Turkish Land Forces Command. The project is being supervised by the Undersecretariat for Defence Industries of Turkey with the new purpose-built factory built at Golbasi, near Ankara. Assembly started in August 1990 and production late in 1991. Local content increased to 76 per cent by the end of the last programme year from 24 per cent, which was achieved at the end of the first programme year. Late in 1989, CMI Defence was awarded a contract to build 285 hulls for the Turkish programme and subsequently provide the equipment required to build the remaining 1,413 hulls in Turkey. Delivery of the hulls was spread over a three-year period with the first hulls completed in Belgium late in 1990. The first 135 AIFVs were fitted with a DAF Special Products (which no longer exists) one-man turret armed with an Oerlikon Contraves 25 mm cannon and a 7.62 mm coaxial machine gun. 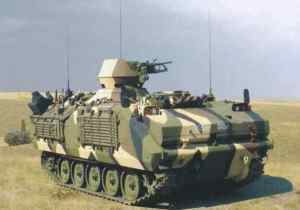 In May 1992, it was stated that future vehicles would be armed with a French Giat Industries (now Nexter Systems) one-person Dragar turret armed with a 25 mm Nexter M811 cannon and a 7.62 mm coaxial machine gun. 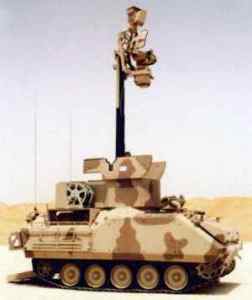 The installation of Giat (now Nexter Systems) turrets on to the AIFVs began in 1997. The total order was for 515 turrets of which the first 67 came direct from France with the remainder being manufactured in Turkey, NUROL building the turret and MKEK the 25 mm cannon. A total of 650 vehicles were built and fitted with a one-man turret armed with a 25 mm cannon and a 7.62 mm coaxial machine gun. Total of 13 personnel carried with a maximum combat weight of 13,687 kg. A total of 830 vehicles built and fitted with a one-man turret armed with a .50 (12.7 mm) M2 HB and a 7.62 mm machine gun. Total of 13 personnel carried, with a maximum combat weight of 12,948 kg. A total of 170 vehicles built and fitted with a turntable-mounted 81 mm mortar and also armed with a 7.62 mm machine gun. Total of six personnel carried and a maximum combat weight of 12,965 kg. A total of 48 vehicles built and fitted with the Norwegian ALT one-man turret with two TOW ATGWs in the ready to launch position. Total of four personnel carried, with a maximum combat weight of 13,715 kg. There will be no further production of this model as the company that built this turret has now ceased trading. Deliveries of the original 1,698 vehicles for the Turkish Land Forces Command have now been delivered. An additional order was subsequently placed for a further batch of 551 vehicles. All of these were in the AAPC configuration. These were delivered to the Turkish Land Forces Command between December 2001 and December 2004 and be armed with an externally mounted .50 (12.7 mm) M2 HB machine gun. 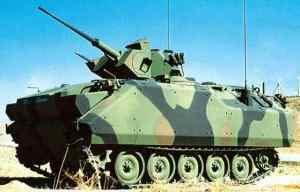 The chassis has been modified to incorporate a TDA 120 mm Recoiling Rifled Mounted Mortar 2R 2M in the rear of the vehicle. Additional details of this system are given in a separate entry. The 120 mm mortar, which is provided with a semi-automatic loading system, has a traverse of 220° left and right and an elevation from +42 to +85°. The mortar fires through a two-part roof hatch, which opens left and right. A prototype of this system was completed several years ago and it has been demonstrated in the Middle East. For this programme, FNSS developed a vehicle that incorporated a new hatch and base plate. As of early 2008 this remained at the prototype stage. In addition to the above 120 mm AMS, FNSS Savunma Sistemleri have also trialled the Swiss RUAG Land Systems 120 mm Bighorn smoothbore mortar system. This is fitted with a semi-automatic loading system and the mortar has a traverse of 45° left and right with elevation from +40 to +85°. As of early 2008, the 120 mm Bighorn mortar system remained at the prototype stage. This has been developed as a private venture between FNSS and Aselsan and comprises a command and control system, Aselsan Falconeye electro-optical sensor suite, Aselsan RT 5101 and VRC 9600 radios, Aselsan 6680 intercom and other peripheral equipment. The mast-mounted sensor pod includes a second generation thermal camera, colour day TV camera. Eye-safe laser range-finder, and also a laser pointer. A digital compass and embedded GPS is also installed. 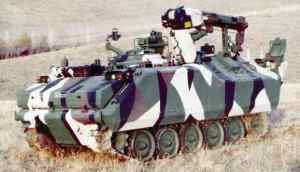 FNSS Savunma Sistemleri has developed a stabilised turret (called Sharpshooter) for the AIFV which is electrically operated and controlled and is armed with a 25 mm ATK Gun Systems Company M242 Chain Gun and 7.62 mm coaxial machine gun. This has been developed as a private venture, with the first export customer being Malaysia. To meet the requirements of potential customers in the Middle East for a vehicle mounted long range anti-tank guided weapon (ATGW) system, FNSS Savunma Sistemleri of Turkey and Lockheed Martin Missiles and Fire Control of the US teamed to market the Hellfire ATGW on the Turkish Armoured Combat Vehicle (ACV) chassis. The Manned Hellfire Turret System (MHTS) has been developed as a private venture by Lockheed Martin Missiles and Fire Control and is a self-contained weapon system with four Hellfire long-range ATGW in the ready-to-launch position. When being launched from the MHTS in the autonomous mode the Hellfire missiles have a maximum range of 5,000 m but when used in the co-operative mode with a forward observer this is increased to over 8,000 m.
Targets can be engaged under day and night conditions and the AGM-114 missiles are the same as that launched from the AH-64, AH-1W and S-70B helicopters. The turret has powered traverse through a full 360° with elevation from -10 to +20°. In addition to the four missiles in the ready-to-launch position another four missiles are carried internally for manual reloading. This was completed late in 1999 and has a stretched chassis with six road wheels either side and not only increased internal volume but also has increased mobility and a modular armour package. Late in 2006 an undisclosed customer in the Middle East placed a contract for ten of these vehicles in the Tactical Command Post Vehicle (TCPV) configuration for delivery in 2007. Full details of the Armoured Combat Vehicle - Stretched are given in a separate entry. In 1997 the United Arab Emirates awarded FNSS Savunma Sistemleri a contract for 136 specialised variants with first deliveries being made in 1999. This covered the supply of 53 ACV Engineering Squad Vehicle (ACV-ENG), eight repair/recovery vehicles fitted with a crane and winch and 75 artillery support vehicles. The UAE ACV were the latest production standard and have the company designation of the ACV 350 with the latter figure indicating the rating of the engine in hp. 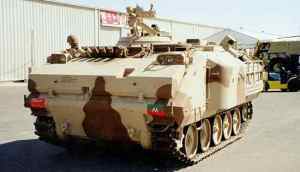 The UAE vehicles are a new enhanced tropicalised version of the AAPC and are fitted with a Detroit Diesel 6V-53TA engine developing 350 bhp coupled to an Allison X-200-4B automatic transmission. A new high temperature cooling system is fitted that allows the vehicle to operate in ambient temperatures of up to +52°C. The ACV-ENG has a crew of three, commander, gunner and driver and has been designed to transport a squad of combat engineers and their specialised equipment. Variants of the ACV-ENG include command post and reconnaissance. The vehicles are fully amphibious, being propelled in the water by their tracks, and also feature a new FNSS Savunma Sistemleri developed weapon station which allows the gunner to aim and fire the .50 (12.7 mm) M2 HB machine gun under full armour protection. Mounted at the front of the hull is a bank of six electrically operated smoke grenade launchers. Standard equipment includes an NBC system of the overpressure type, full air conditioning and external stowage on the sides of the vehicle for specialised engineer equipment. The artillery support vehicles includes a specialised Artillery Forward Observation Vehicle (ACV-FOV) which will be used to acquire targets for self-propelled artillery systems. This has a mast-mounted sensor pod that includes day/thermal cameras, laser range-finder and surveillance radar. Final deliveries took place in late 2000. 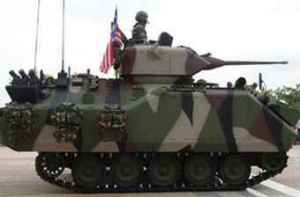 Late in 2000, Malaysia placed an order for 211 vehicles in 10 variants based on the ACV 300 version with a 300 hp Detriot Diesel. The first vehicles were delivered to Malaysia in early 2002 and named Adnan. Of the 211 units it is understood that 146 were assembled in Turkey and the rest in Malaysia by DEFTECH, a subsidiary of DRB-HICOM Berhad. Final deliveries of the first order for 211 vehicles were made late in 2004. It is understood that an additional order will be placed for a further batch of 66 vehicles, to equip a total of three battalions. As of early 2008 no additional orders had been placed by Malaysia. Some of these vehicles are fitted with a Thales laser warning system, coupled to a bank of 76 mm electrically operated smoke-grenade launchers mounted at the front of the vehicle. Of these vehicles, some have an additional bank of electrically operated smoke-grenade launchers installed in the left side of the hull at the rear, which cover the frontal arc. 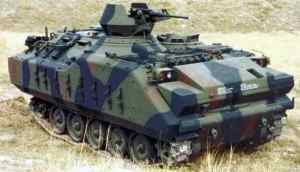 FNSS Savunma Sistemleri is also offering to upgrade the M113 family of vehicles into the latest A300 configuration, which includes a 350 hp, 300 hp or 250 hp 6V-53T Detroit Diesel engine coupled to an Allison X200-4 automatic transmission. According to FNSS Savunma Sistemleri, the A300 configuration provides higher mobility, higher internal volume, improved cooling performance in extreme conditions and better survivability. A full NBC and air conditioning system is also available in this configuration. 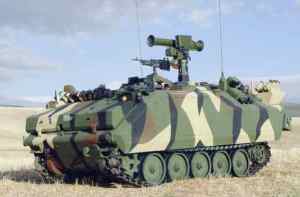 AIFV equivalent suspension, steering, fuel and electrical systems are available in M113 A300 configuration with various other optional equipment to meet different customer requirements. 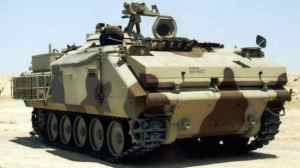 In 2007 FNSS Savunma Sistemleri was awarded a major contract from an undisclosed Gulf Cooperation Country (GCC), believed to be Saudi Arabia, to upgrade about 300 US supplied BAE Systems, Ground Systems M113 series armoured personnel carriers (APC) and variants to a higher standard. This work will be carried out in the GCC country using kits supplied by FNSS Savunma Sistemleri with first vehicles expected to be returned to service in 2008. In addition to APC variants to be upgraded there are also a number of variants including command post vehicles and mortar carriers. The M113 APC upgrade is extensive and includes the installation of a new powerpack consisting of a Detroit Diesel Model 6V-53T engine developing 350 hp coupled to an Allison X200 series automatic transmission, additional applique armour, internal spall liners, air conditioning system and a chemical detection unit. 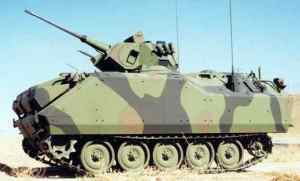 FNSS Savunma Sistemleri has also been awarded a contract from Bahrain to refit an undisclosed quantity of M113A2 series APCs, currently armed with a 81 mm mortar with a new 120 mm mortar system. This work will be carried by FNSS Savunma Sistemleri at its main facility in Ankara, Turkey.